Above, the 1816 Mill Seat Map is superimposed over a map of present-day Delaware. Use your mouse to zoom in and click on any of the illustrated waterwheels to learn what industry they powered, or explore the map in its own window. In 1816 the surveying firm of Fairlamb & Reid made a map of the Brandywine River between Rockland and Wilmington. Along the length of the river are drawn 86 small spoked wheels. Some are colored orange, and others are simple outlines. Most of the latter bear descriptions, such as ”J&T Gilpin’s Cotton and Paper Manufactory” or “E. I. duPont’s Lower Powder Factory.” In the lower right-hand corner of the map, sixteen wheels are grouped together under the heading “Flour Mills” though each also bears the name of its owner. At each of the sites marked on the map, a water wheel turns machinery and powers local industry. This map is a wonderful tool for learning about the power of water in early Delaware industry. 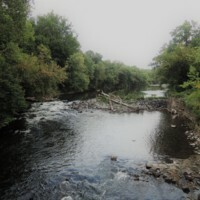 With a little exploration, we can learn what industries thrived on Brandywine Creek in the early nineteenth century, and how their owners chose to pursue many different types of manufacturing – often simultaneously. To learn more about the different industries represented on the Brandywine Creek in 1816, zoom in and click on any of the water wheels drawn on the map. On this map, some of the wheels are labelled with the industries they ran. A large group, however, are unlabeled and instead colored orange. These wheels are grouped onto plots of land. 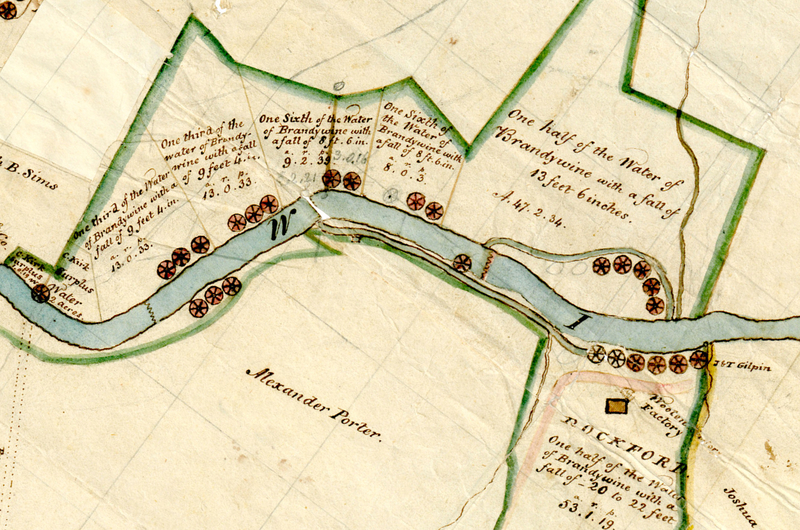 Each plot lists both the drop in the height of the river over the length of the property as well as the amount of the river’s water which the miller might use. This is because these icons represent not actual mills, but rather available sites which have adequate water supply to power a mill. Using the electricity analogy, these sites are not un-like available wall sockets. Close-up, Mill Seats on the Brandywine River. Image courtesy of the Hagley Museum and Library. Reconstructed water wheel at Old Strubrige Village in Sturbridge, Massachusetts. To make use of the energy present in the river, water is forced to pass over or under a large wheel fitted with vanes. The water turns the wheel, and the rotational energy of the wheel is then transformed to power machines. This process might be quite direct, as in a grist mill, where the rotating wheel causes a grindstone to spin. The rotational power of the mill might also be transformed into the vertical motion of a saw mill’s blade. Just as we use electrical outlets to power a variety of devices today, so too millers got creative with the energy source available in the river. They often ran multiple industries beside each other, or adapted water power from one type of manufacturing to another as the economic situation changed. July 29, 1795 newspaper advertisement for writing and printing papers sold by William Young, Bookseller and stationer, corner of Chestnut and 2nd Streets, No. 52, Philadelphia. Photo courtesy of the Delaware Historical Society. One such entrepreneur was William Young. Born in Scotland in 1755, Young immigrated to Philadelphia in 1784, where he soon owned a printing press and book store. In the 1790’s Young made the leap from printing and selling paper to making it. He purchased land on the Brandywine Creek from Caleb Kirk, and opened a paper mill at Rockland, Delaware. He sold the paper he produced at his Philadelphia shop. Paper mills harnessed water power to run stamping mills or engines which processed second-hand rags into pulp, a combination of water and fiber, from which sheets of paper could be formed. At Young’s mill, creating the paper was still a hand process, so the mill combined water-powered machinery with vat men performing the skilled labor of pulling sheets of paper from the pulp vat on screened frames. In 1817 the Gilpin brothers, Joshua and Thomas, successfully copied British papermaking technology which allowed the entire process to be automated, but by that time, William Young’s paper mill had been destroyed by fire. "…The whole of the Delaware paper mill together with all the stock and machinery, were destroyed by fire, no lives are lost nor has any person been hurt. The fire spread from a part of the vat next to the Brandywine creek. It is not ascertained whether from the in or the outside of the vat house. The hands from the woollen factory had passed about half after eleven on their way home from the other side of the creek when no light appeared. The alarm was given about two o’clock. At first a few hands might have saved all, but when the fire entered the main body of the mill, its ravages became uncontrollable. Very little damage is done to the building intended for the woollen factory. Some of the apparatus intended for the woollen factory was in the other end of the mill, the greatest part of which was removed by the activity of those who had first received the alarm, but it was impossible to save any of the machinery of the paper works, except one press… The loss in mingled with many mercies. No suspicion of its being the work of an incendiary." 1816 advertisement for William Young, Son, & Co, Manufactures of woolen goods. William Young Papers, Delaware Historical Society. Though Young’s paper mill was destroyed, he was beginning to diversify his business around the same time, and so by 1815, Young had opened a woolen mill at Rockland. As you explore the Brandywine Mill Seat Map, you will see that it is quite common for one miller to take part in many different industries. Young is a good example of this. He is also a good example of how ephemeral business ventures might be. Many millers suffered physical or financial loses, due to fires or freshets (floods which wiped out dams or mill wheels), poor financial planning, or changes in the market. By the time Fairlamb & Reid drew this Brandywine Mill Seat Map in 1816, Young seems to have owned both sides of the creek at Rockland. 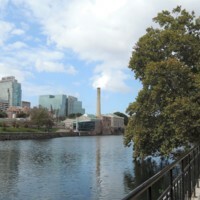 On the east bank was the former site of his paper mill. On the west bank, Young had a woolen factory. If the map makers had finished their work – and we can see that they did not, as other parts of the map, including the oval cartouche, remain undrawn – the nine wheels in the top right-hand corner of the map, which align with modern-day Rockland, would surely have been labeled William Young, Son, & Co. Woolen Factory. This 1816 map allows us to chart a path of exploration around the Brandywine Creek in the early-nineteenth-century. It's original purpose was to help business people understand the latent power of the river for industry. Today it helps us learn about how those business people - men like William Young - thought, and how they utilized the river for an impressively wide variety of ventures. Many sites from the 1816 map, and from William Young's life, can be observed in the landscape of Northern Delaware today. 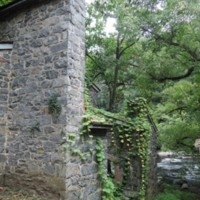 If you have a chance, it is worth exploring the banks of the Brandywine and the other streams and rivers near by for traces of the watermills which once dotted their banks. The Brandywine in downtown Wilmington, 2017. Black Powder Mill at the Hagely Museum, 2017. Rockland Delware, the site of William Young's Brandywine enterprises, as seen in 2017. William Young's house on Black Gates Road in Rockland, Delaware. 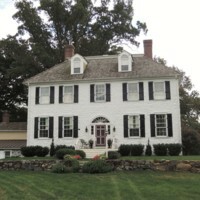 Built in 1801, it is now a private residence.